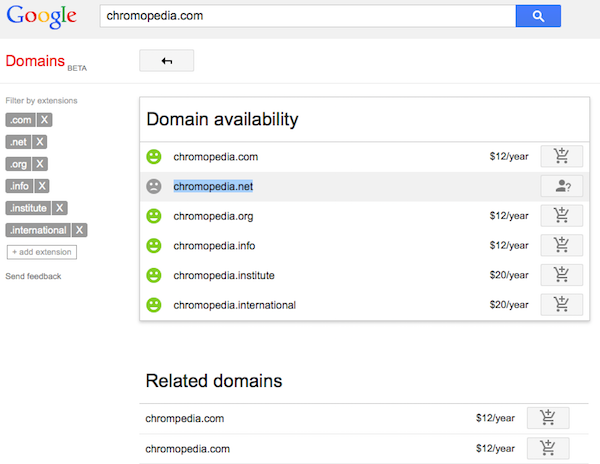 Google's answers obtained from web pages now include the date when the page was last updated. 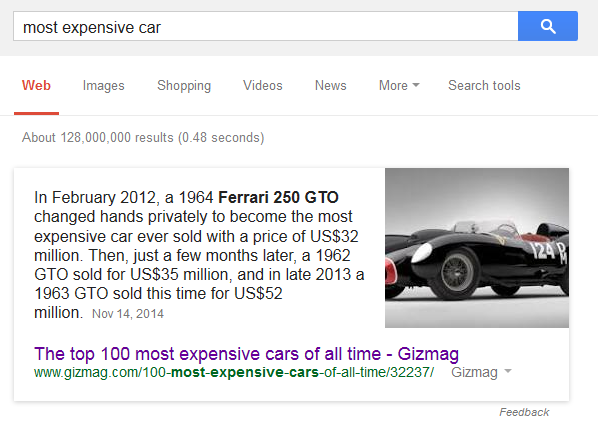 Search results also include this information and it's pretty useful because a news article from 2004 would provide a different answer for "what's the most expensive car?" than an article from 2014. YouTube Music Key is not just for YouTube's mobile apps. One of its feature is also available if you use YouTube's desktop site: ad-free music videos. You'll notice the "ad-free" label next to the video title. Mouse over the label and you'll see this message: "Your YouTube Music Key subscription lets you play this video without ads." "Subscribe to YouTube Music Key and you'll be able to listen to music without seeing or hearing ads. Ads won’t be shown before or during eligible music videos you watch on youtube.com, and music videos and playlists will play continuously on your mobile device, without interruption. You will still see ads on other YouTube videos, however. 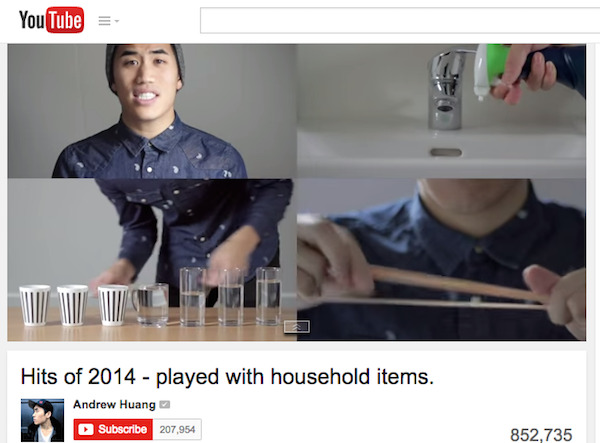 The Ad-free badge tells you that a video will be ad-free," informs YouTube. An important downside of YouTube Music Key is that YouTube treats music videos just like Google Play Music songs. You can't play music videos on 2 different Android/iOS mobile devices when using the YouTube app and the same Google account. Let's say I play a YouTube music video on an iPad and then try to play another music video on a Nexus 5. 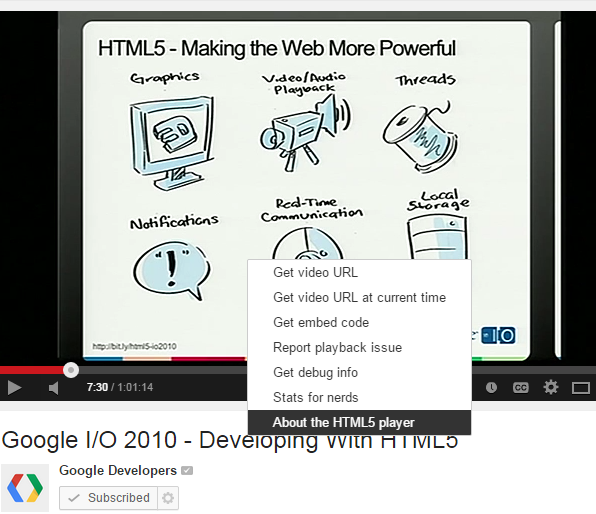 YouTube shows this message: "Playback paused because your account is being used in another location". That means I can't play YouTube music videos on multiple mobile devices at the same time. This is strange, especially when you realize that YouTube Music Key is only available in the Android app. If I sign out, I can play music videos, but YouTube Music Key features are disabled (background playing, offline caching, no more ads). 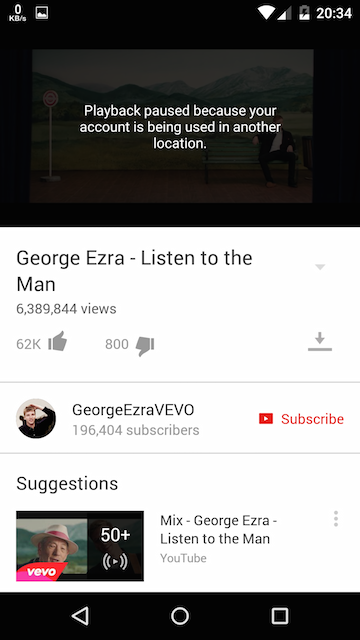 I can also play music videos in Chrome or other mobile browsers, where YouTube Music Key features aren't available. Google Play Music has a similar limitation: "If you play music on multiple devices at the same time using the same account, playback will be paused so you can choose which device you'd like to use. To help ensure uninterrupted playback, make sure you're listening to music using one device or computer at a time." Maybe it would be a better idea to enable Music Key on a single device at a time and disable its features when using other devices. This way, you could still use the YouTube app and play music videos just like any other videos. 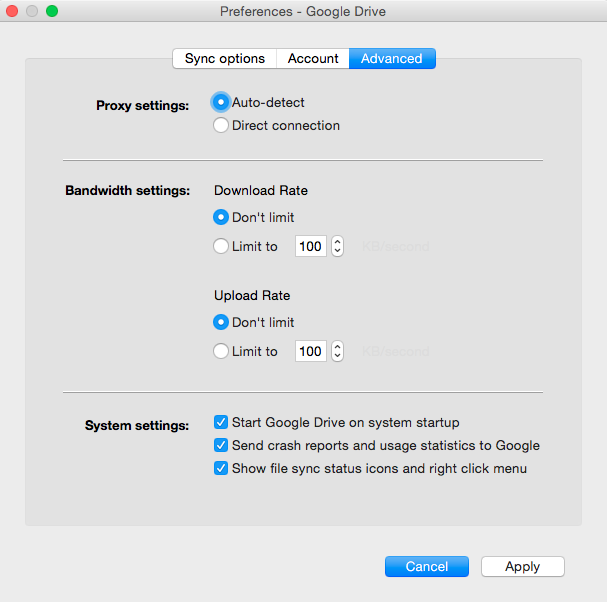 Google updated the Drive app for Windows and Mac. The latest version (1.19.8268.4572) brings new features: the Drive menu shows the latest synced files, there's a new three-dot contextual menu that shows the previous items from the standard menu and you can limit bandwidth for both downloads and uploads from the settings. It's interesting to notice that all these features have already been available in the Dropbox app. Google Translate's mobile apps are about to get a major upgrade. The latest version of the Google Translate app for iOS and Android adds support for instant translation with Word Lens and improves the conversation mode. The iOS app also adds support for conversation mode and camera translation, which were already available in the Android app. 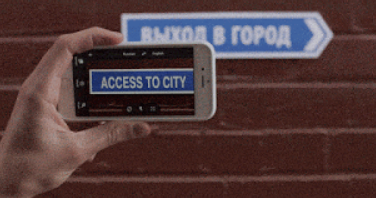 "While using the Translate app, just point your camera at a sign or text and you'll see the translated text overlaid on your screen - even if you don't have an Internet or data connection. This instant translation currently works for translation from English to and from French, German, Italian, Portuguese, Russian and Spanish, and we're working to expand to more languages," informs Google. There's already camera translation, which works in 36 languages, but the new Word Lens is smarter and easier to use. Google bought Word Lens last year and this is the first tangible result of the acquisition. Conversation Mode is smarter too: the app will now recognize the languages automatically, so you don't have to tap the microphone button. 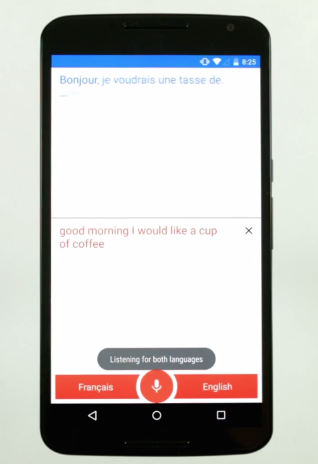 "Starting today, simply tap the mic to start speaking in a selected language, then tap the mic again, and the Google Translate app will automatically recognize which of the two languages are being spoken, letting you have a more fluid conversation. For the rest of the conversation, you won't need to tap the mic again - it'll be ready as you need it," explains Google. The new version of the Google Translate app for Android and iOS is rolling out over the next few days. A few readers noticed that Chrome's stable version started to enable the account switcher added back in August to Chrome Beta. "Get started by clicking on 'You' in the upper right corner of your Chrome window and then clicking 'Sign in to Chrome.' You'll be able to switch devices and pick up where you left off with all of your tabs, bookmarks, and history automatically kept in sync. 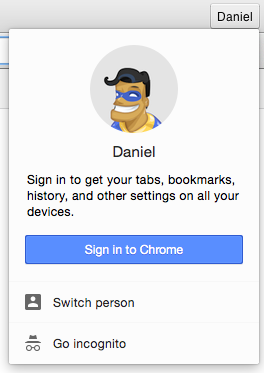 If you share a computer, click 'Switch person' to add your profile and get your own bookmarks, apps, and theme. 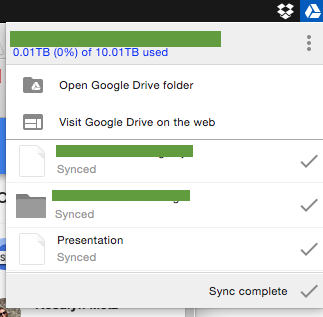 Switching lets you keep your stuff separate," explained Google. There's also support for guest mode. 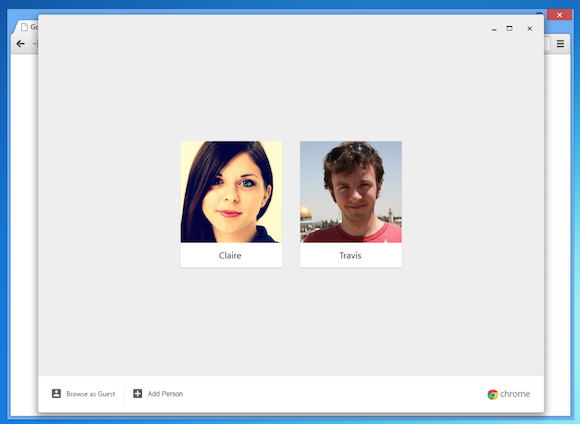 "With the new 'Guest mode,' you can let others use Chrome without letting them see your stuff. And after they've closed out their tabs, their browsing information is deleted from your computer as well." That's the main difference between incognito and guest mode: guest mode is treated as a separate profile that doesn't have access to the data from your main profile. 2. select "Enable" in the dropdown below "Enable the new avatar menu"
4. click "Relaunch now" at the bottom of the page to restart the browser. Pick "Disable" instead of "Enable" to turn off the new avatar menu. 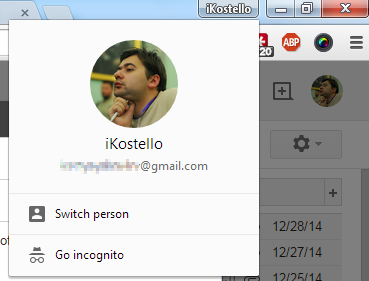 With features like guest mode and account switcher, Chrome looks more and more like an operating system. After all, these features were borrowed from Chrome OS. 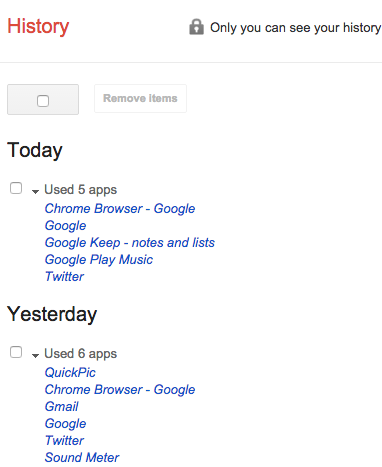 Google's Account History page has been updated and includes a few new features. The last time I checked this page, Google allowed you to pause or disable search history, location history and YouTube's search and watch history. The search history card is now called Web & App Activity and deals with searches and browsing activity. 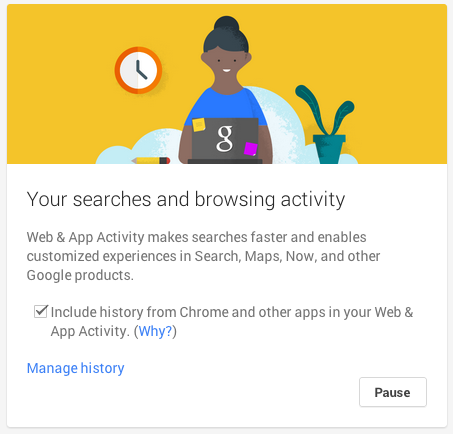 In addition to the Google Search history, there's also an option to "include history from Chrome and other apps in your Web & App Activity." If this feature is enabled, Google saves information like your Chrome browsing history, the apps you use and the data they share with Google. "This lets you see things like sites or content that you've looked at in other apps in your Google search results," explains Google. When you uncheck "include history from Chrome and other apps in your Web & App Activity", Google shows this warning: "Pausing this setting may result in fewer content suggestions in products like Google Now or Google+, and some autocomplete suggestions in Search will not appear. 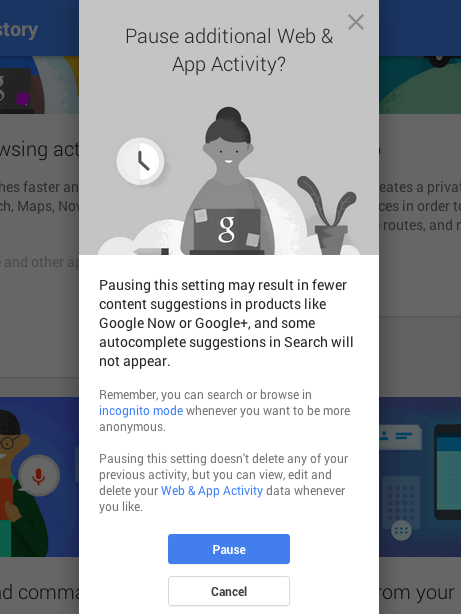 Remember, you can search or browse in incognito mode whenever you want to be more anonymous." There's a page for Web & App Activity history: https://history.google.com/history/app and it shows the mobile apps you've used on your Android devices. You can remove this information. Google added 2 new cards for Voice & Audio Activity and Device Information. "Voice & Audio Activity helps recognize your voice and improve speech recognition by storing your voice and audio inputs to your account (for example, when you say 'Ok Google' to do a voice search)." This feature is automatically turned on by the mobile Google Search app when you enable the always-on OK Google hotword. You can see the audio history here: https://history.google.com/history/audio. 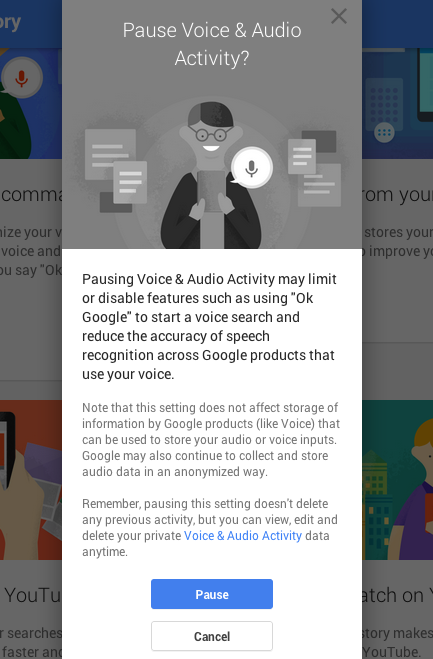 When you pause audio activity, Google shows this message: "Pausing Voice & Audio Activity may limit or disable features such as using 'Ok Google' to start a voice search and reduce the accuracy of speech recognition across Google products that use your voice. Note that this setting does not affect storage of information by Google products (like Voice) that can be used to store your audio or voice inputs. Google may also continue to collect and store audio data in an anonymized way." There's also a section for device information, which "stores your contacts, calendars, apps, and other device data to improve your experience across Google". You can find the device history here: https://history.google.com/history/device, but it's not very useful. 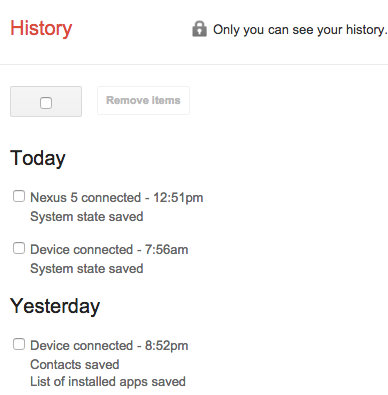 Google shows status messages like: "System state saved", "Contacts saved", "List of installed apps saved". Click the Pause button and you should see this warning: "Pausing Device Information means you will receive fewer reminders about upcoming events, and features like speech recognition (especially of names in your contact list) may be less reliable. 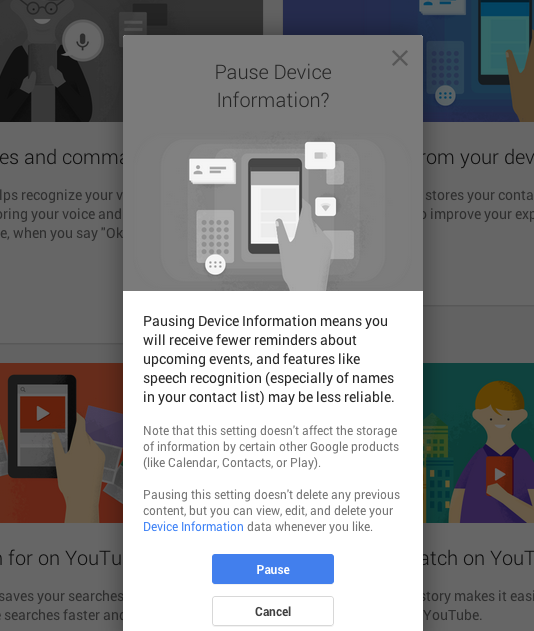 Note that this setting doesn't affect the storage of information by certain other Google products (like Calendar, Contacts, or Play)." 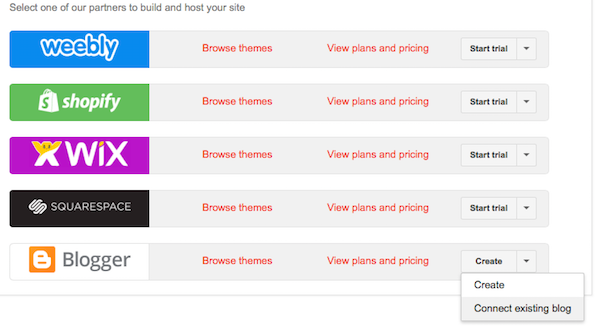 Some of these features were already available, but it's now easier to disable them from Google's account settings. 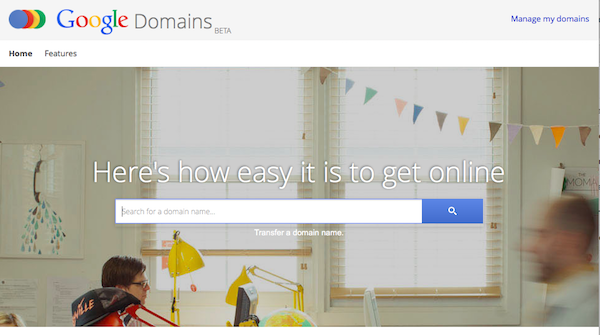 Google Domains is now available to everyone in the US. Until now, Google's service required an invitation. * dynamic DNS: "setup your domain and keep it pointing to the same computer even when the IP address changes". "We're excited to share the open beta with you today and still welcome your input, questions and feedback", says Google. Now that custom Google Maps are available in Google Drive, you may wonder how to find them. "My maps" is not included in the list of file types from the advanced search, but you can use the "opens with" feature that was added in the new Google Drive interface. Just click the arrow from the search box, select "Google My Maps" from the "opens with" list and click the search button. Google Drive will display all the maps you've created in Google My Maps. Another option is to search for app:"google my maps". You can add some keywords to the query to find a map. Google uses the notification messages you receive in Gmail to display useful information in Google Now, Google Search and other Google services. 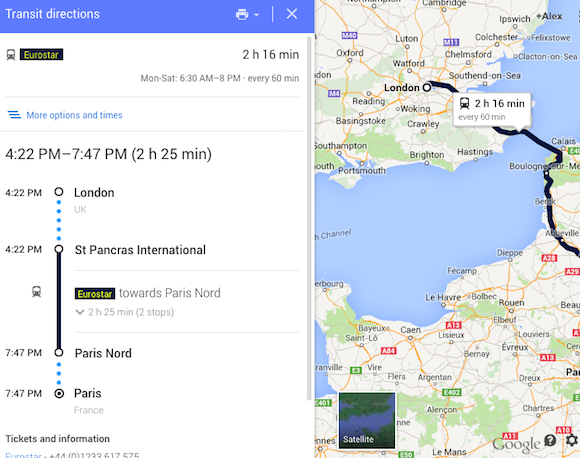 For example, Google shows details about your purchases, reservations, flights and more. 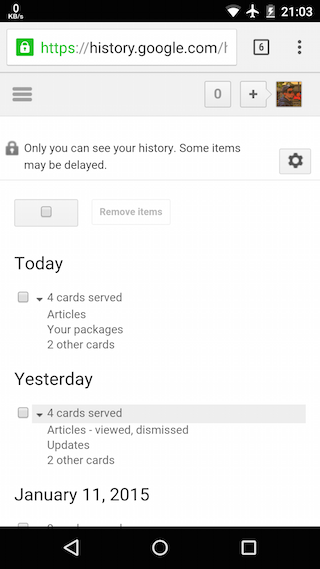 Google Dashboard has a new section for package tracking. If you scroll down to the package tracking section, you'll probably see this information: "Package tracking data is accessible (e.g. in Google Now and Google Wallet)." Expand the section and you'll see a button that lets you opt out: "By clicking the button you will opt out of Package Tracking in various Google applications and data will be removed. You can opt in again via Google Wallet or Google Now." I'm not sure why package tracking is singled out and Google doesn't let you disable from Google Dashboard the other features that use data from Gmail. 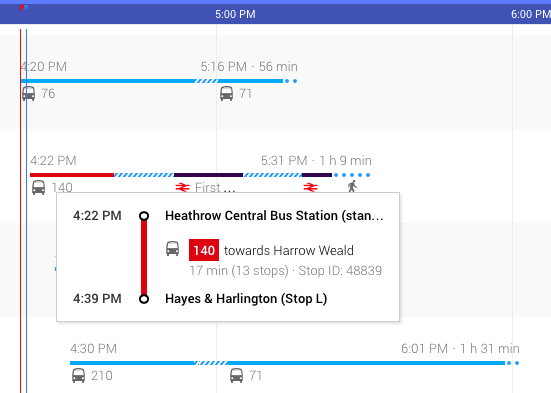 The desktop Google Maps got a Material Design update: the timetable for transit directions is now displayed in an overlay. 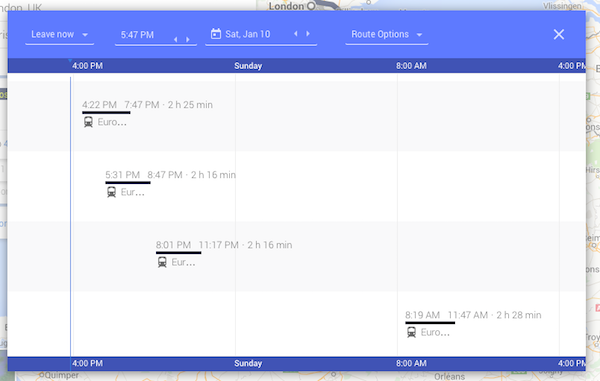 Just click More options and times next to Google's transit directions to see the new interface. Here's an example. "If you're taking public transit, you'll see details about the transit line, trip duration, and schedule. 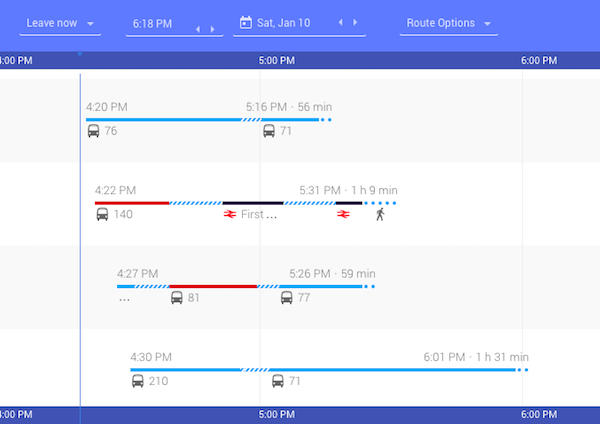 To see other public transit times and enter a specific time, click More options and times. From here, you can see key information: overall travel time for your route, time spent walking (dotted lines), time spent on transit (solid lines), transportation lines used. To see the next scheduled departure, click Leave now. Or choose a different time and date for your directions in the boxes at the top. Click on a trip to select it and see it on the map. Click Route options to narrow your directions down to a particular type of transit. You can also choose Fewer transfers and Less walking," informs Google. 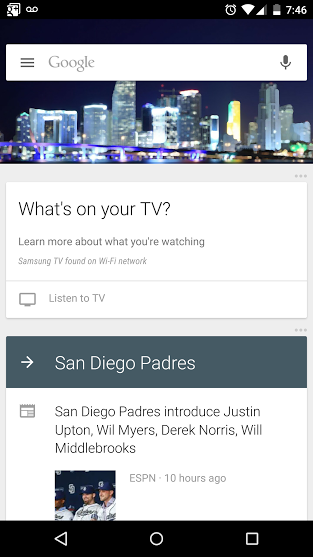 Android TV is Google's second attempt to bring Android to TVs (the first one was Google TV). 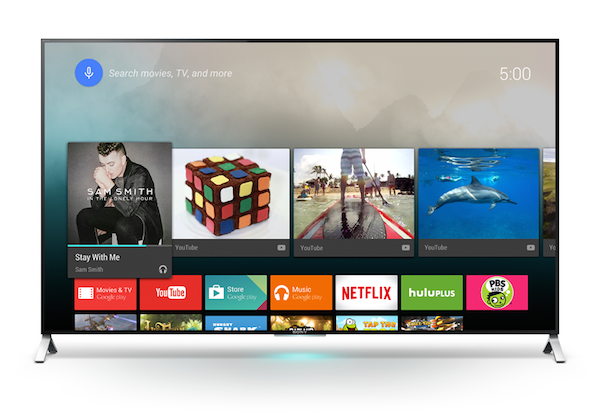 After Chromecast's success and the launch of Nexus Player, Google partnered with a few TV manufacturers that will launch Smart TVs powered by Android TV. "This spring, Sony, Sharp and TP Vision, with its range of Philips TVs, will start shipping televisions powered by Android TV. These have all the goodness of Android TV built in so you won't need to plug anything extra into your television. You can use a single remote to watch live TV channels and play games, movies or shows from Google Play and your apps. These televisions feature voice search, to help you quickly find what you want, and they're Google Cast Ready so you can cast your favorite entertainment from your phone or tablet to the big screen," mentions Google. From The Verge: "Live at CES 2015, Sony's CEO Kaz Hirai announced that the company's new smart TVs will run on Google's new platform for television, Android TV. The remote control for the TV is essentially a giant trackpad, so that you can navigate the Android TV interface more easily. The remote also comes with a microphone, to make searching easier." According to Sony, "all new 4K and some new Full HD BRAVIA models will come equipped with Android TV." Other manufacturers use different operating systems: Samsung uses Tizen, LG uses WebOS, while Panasonic launches Firefox OS Smart TVs. It's interesting to notice that Samsung and LG use their own operating systems to power smartwatches, smart TVs, smart washing machine, smart vacuum cleaners, cars and more. "The OS of everything - Tizen is the open-source operating system for all device areas," mentions Tizen's homepage. Having their own operating system allows them to control their own destiny and launch new devices without relying on software from Google. 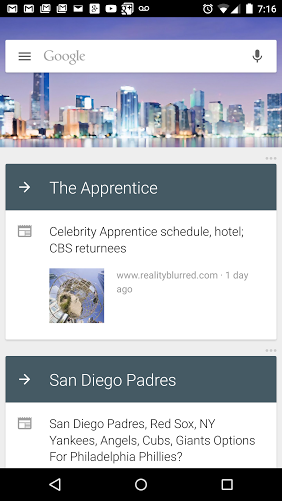 Sterling Alvarez, a reader of this blog, noticed a new Google Now background image that shows some buildings from downtime Miami. He's from Miami, so it's likely that Google tests a feature that displays photos related to your location. Google Now already shows custom images for cities like London and San Francisco, but they're background illustrations. The new ones look more realistic and they're pretty small, since they look pixelated. I'm running Android Lollipop on my Nexus 5 and I must say that this is a great Android release, the best Android experience on a mobile device. Many reported performance issues and various bugs, so Lollipop still has a way to go until it's properly optimized. Google has recently updated the Android platform distribution numbers and it's interesting to notice that Lollipop still doesn't show up, 2 months after its release. Google doesn't display Android "versions with less than 0.1% distribution", so it's obvious that less than 0.1% of the Android devices run Lollipop. Back in June, Google reported that the number of active Android users was 1 billion, while in May 2013, the number of Android devices that were activated was 900 million. It's hard to estimate the number of Android devices that run Google Play Store (this excludes Amazon devices and Android devices from China), but assuming that the number is still around 1 billion, this means that less than 1 million Android devices run Lollipop. In January 2014, Android stats looked different: KitKat's market share was 1.4%, 2 months after its release. "KitKat, which was positioned at 1.1% last month, has eked out an additional 0.3% to reach 1.4%," reported Android Police back then. So why is Lollipop's market share growing so slowly? * The Lollipop launch devices (Nexus 6 and Nexus 9) were more expensive, more difficult to find and reviews weren't that great. I've checked Google's Play Store US site and Nexus 6 is still out of stock. Google no longer offers an affordable tablet (Nexus 7), while Nexus 6 is not a phone for everyone: many people think it's too big. * A lot of users reported issues after updating to Android 5.0 and some of them downgraded their devices to KitKat. Other users no longer updated their devices, after reading all the news articles about Lollipop issues. * Google didn't push Lollipop to all Nexus devices. I have a Nexus 2012 WiFi and there's no Lollipop OTA update in the settings. * Some Nexus and Google Play Edition devices started to get the Lollipop update late. Galaxy S4 GPE was the last to get Android 5.0. Despite all of these issues, Lollipop is available for a lot of devices: Nexus 4, Nexus 5, Nexus 6, Nexus 7 (2012), Nexus 7 (2013), Nexus 9, Nexus 10, Galaxy S4 GPE, Moto G GPE, One M7 GPE, One M8 GPE, Sony Z Ultra GPE, LG GPad 8.3 GPE (GPE = Google Play Edition). No other Android release was available for so many devices in the first 2 months. Some Android manufacturers already started to release Lollipop updates for phones like Moto X (2014), LG G3 and Samsung Galaxy S5. HTC promised to update HTC One M7 and M8 this month. With so many popular devices getting updates, Lollipop's market share will grow much faster in the coming months. 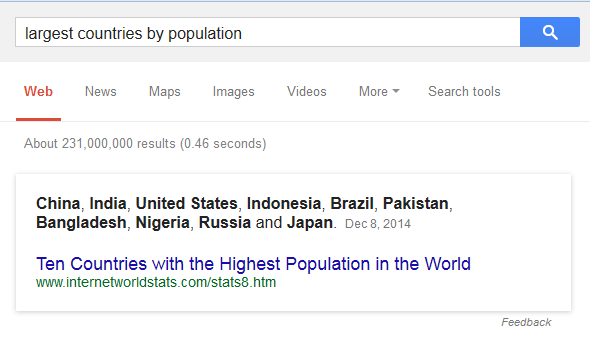 Google's answers aren't always that great. Google picks the snippet for a search result and places it in a special card that is supposed to provide a quick answer. 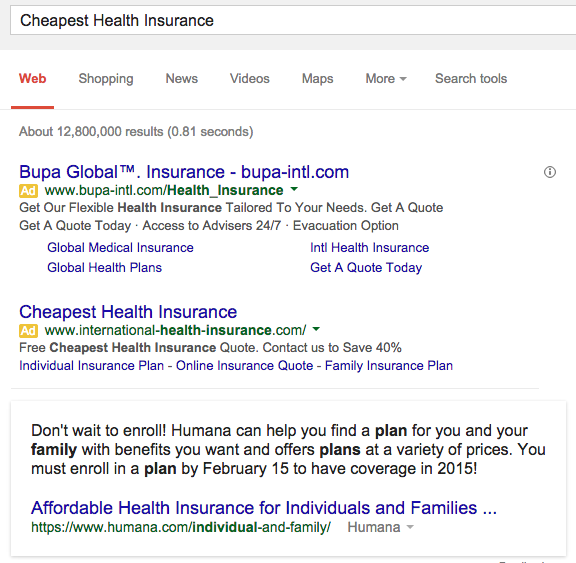 When searching for [Cheapest Health Insurance], Google provides the following answer: "Don't wait to enroll! Humana can help you find a plan for you and your family with benefits you want and offers plans at a variety of prices. You must enroll in a plan by February 15 to have coverage in 2015!". Obviously, the snippet is an ad and not an informative answer to the query. There are questions that are better left unanswered and this is one of them. 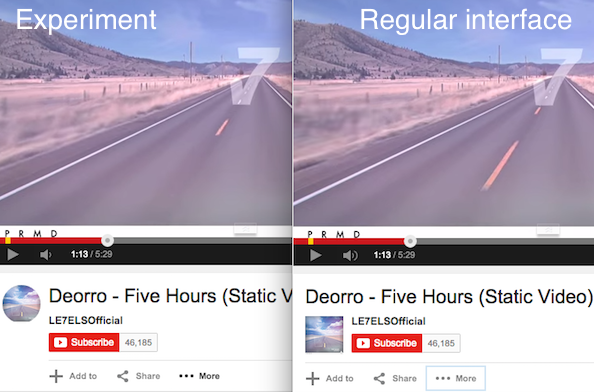 YouTube tests a new feature that hides the player's controls when you're watching a video. To see the controls, you need to mouse over the player and you'll be able to pause the video, use the seek bar, change the volume, hide annotations, switch to the theater mode, play the video in full screen. Player controls are always displayed when the video is paused and after the video ends. While the interface is cleaner and it focuses more on the video that's currently playing, a small seek bar would still be useful, so you don't have to keep moving your mouse to find when the video ends. Chromecast works well for streaming music, but it's not always convenient to use a TV for this. Now that the Google Cast technology from Chromecast is added to other devices (Nexus Player, TVs powered by Android TV), Google Cast-enabled speakers make sense. "Google Cast for audio embeds the same technology behind Chromecast into speakers, sound bars, and A/V receivers. 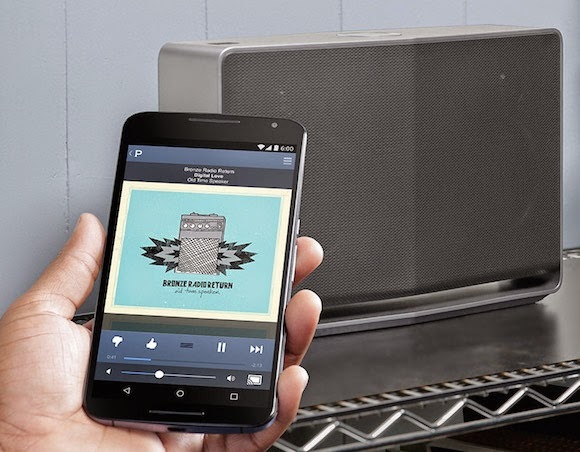 Just like Chromecast, simply tap the cast button in your favorite music or radio app on Android, iOS, or the web, and select a Google Cast Ready speaker to get the party started," informs Google. There are already many Android and iOS apps that support Google Cast: Pandora, Google Play Music, Rdio, Songza, Tunein, iHeart Radio, Deezer, Rhapsody and more. Instead of casting music to TVs, you're casting it directly to speakers. The downside is that you need new speakers that work with Google Cast. "The first Google Cast Ready speakers will first be available in the US this spring from lead brands Sony, LG, and HEOS by Denon with more brands coming later in 2015 with the support of chip makers Broadcom, Marvell, MediaTek and system integrator Libre Wireless. These products will join a growing Google Cast ecosystem, which includes more Android TVs, game consoles and set-top boxes." In many ways, Google Cast is Google's take on AirPlay with a cross-platform twist. Apple's AirPlay started with audio and then it was enabled for video. There are many AirPlay speakers and you can also use Apple's Airport Express to connect speakers. Maybe Google should release a Chromecast version with audio output, so that you don't have to buy new speakers or use adaptors like this one. Google Calendar now lets you change notification time for all-day events. When you create a new all-day event or edit an existing event, you can ask Google to notify you X days before the event at HH:MM. You can also set a default notification time in the settings. "Event notifications tell you about an all-day event at a specified time some number of days before it begins. For example, if you'd like to be alerted about an all-day event at 9 am the day before it occurs, you'd set a notification," informs Google. Eric Ward, a reader of this blog, noticed this new feature and he says that he's "glad to see this feature because previously the reminder was by default at 4:50 pm on the day before the event with no ability to set the time." Google Calendar's help center hasn't been updated and it still informs users that "reminders for All Day events are based on 5:00 pm the day before the event (according to your current time zone). So, if you choose to receive your reminder 10 minutes before your All Day event on August 24th, you'll be reminded on August 23rd at 4:50 pm". Google has a clever way to adapt the dictionary card based on your query. 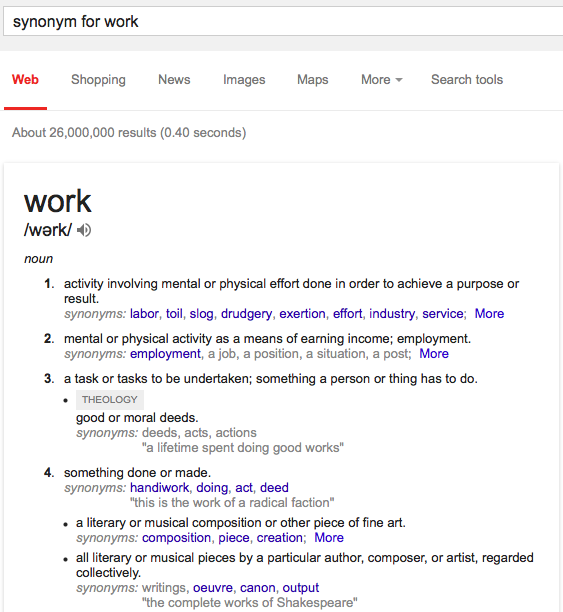 If you search for [work synonym], Google only includes a list of synonyms for each meaning. 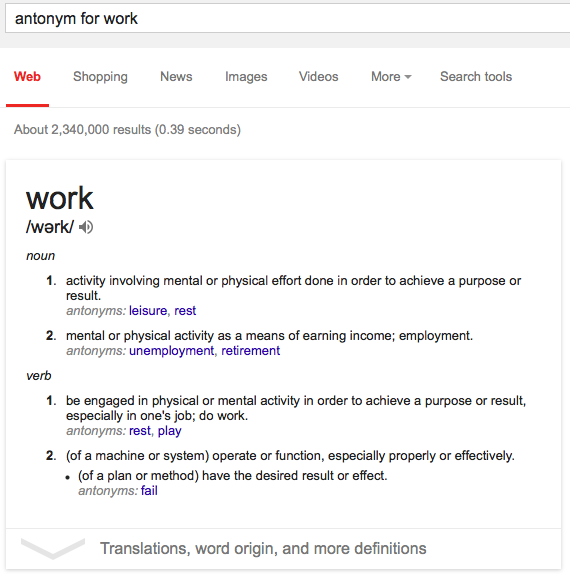 When you search for [work antonyms], Google shows a list of antonyms for each meaning of the word. Expand the card to see all the definitions and to find more information about word, including etymology and use over time. For some reason, when you search for synonyms, Google shows most definitions, so the dictionary card can become quite big if the word has a lot of meanings. Here's an example for "work", which shows the unexpanded card. As you can see, the card uses more space than the list of search results. When searching for a song, Google usually shows a big card that links to the YouTube music video. The card includes a thumbnail and some information about the song (artists, album, release date, awards, lyrics). It's now clear if Google obtains that information from Wikipedia or from other sources, but sometimes Google's algorithms make mistakes. 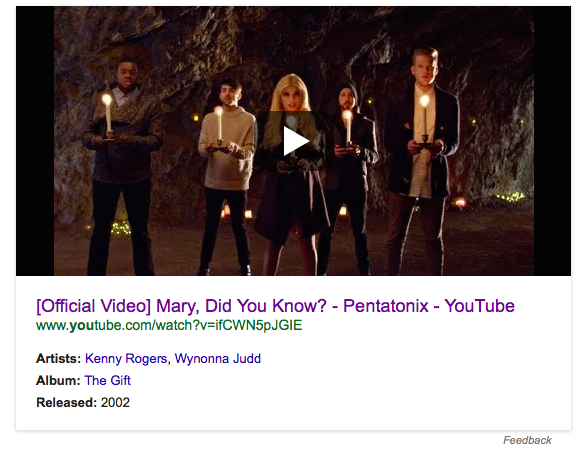 Pentatonix has recently released a cover of "Mary, Did You Know" and Google shows the right YouTube music video when you search for [Mary, did you know]. Unfortunately, the information placed below the video thumbnail is inaccurate. Kenny Rogers and Wynonna Judd aren't the right artists, the song is not from 2002 and the album is not called "The Gift". "'Mary, Did You Know?' is a Christmas song with lyrics and music written by Mark Lowry and Buddy Greene. It was originally recorded by Christian recording artist, Michael English on his solo debut album in 1991. A duet version recorded by Wynonna Judd and Kenny Rogers peaked at No. 55 on the Billboard Hot Country Singles & Tracks charts in 1997," informs Wikipedia. Fortunately, there's a "Feedback" link that lets you report mistakes. 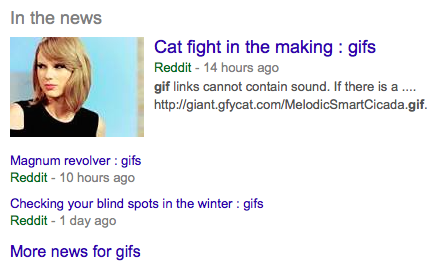 Google's search results used to include a news section that featured relevant articles from Google News. This section was replaced by "In the News", a feature that goes beyond Google News and also shows popular YouTube videos, forum threads and posts from blogs that aren't indexed by Google News. 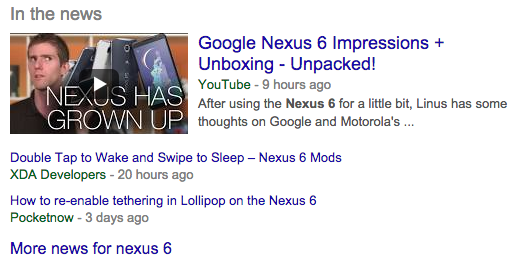 For example, a search for [Nexus 6] returns 3 "in the news" results and none of them is from a site currently indexed by Google News. The first result is a Nexus 6 unboxing, the second one is a blog post from XDA Developers that shows how to enable double-tap to wake and the third result is a PocketNow post about re-enabling tethering. Back in October, a Google spokesperson said: "We will be pulling from all over the web which means that we will present as diverse a range of voices as possible to ensure we get users to the answer they are looking for." The downside is that Google sometimes shows non-news videos and threads, but there's a good side to this: Google's news results are more comprehensive and original sources are included.